A new $3 billion cosmodrome nestled in the remote taiga wilderness of Russia’s Far East, a sprawling, sparkling facility constructed at the behest of Russian President Vladimir Putin, will host its first rocket launch early Wednesday. 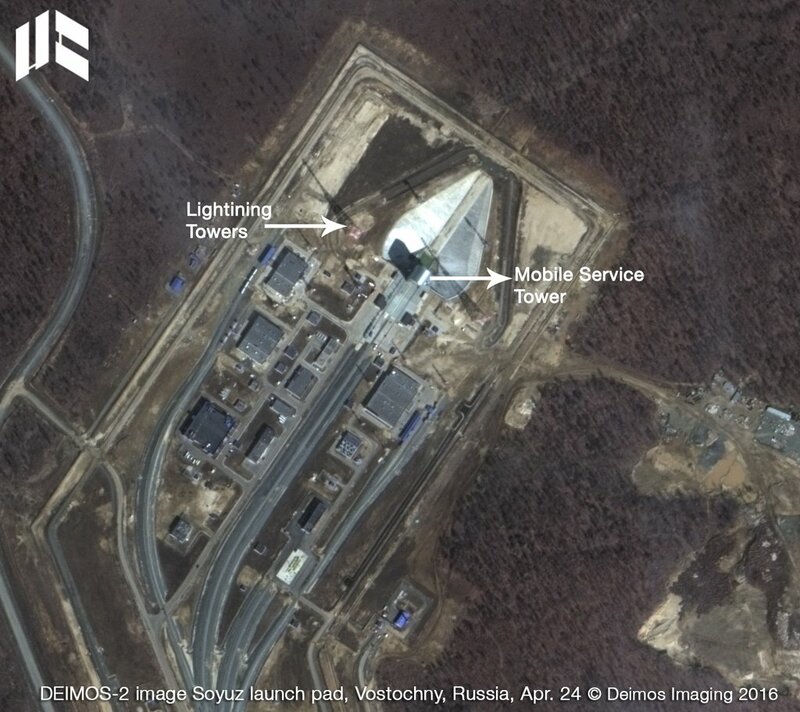 A Soyuz rocket is set to blast off with three satellites at 0201 GMT Wednesday (10:01 p.m. EDT Tuesday) from the Vostochny Cosmodrome, a partially-finished spaceport in Russia’s Amur region near the Chinese border about 3,400 miles (5,500 kilometers) east of Moscow. Liftoff is set for 11:01 a.m. local time at Vostochny. Russian officials gave approval to begin filling the Soyuz rocket will kerosene and liquid oxygen propellants Tuesday. Putin is expected to attend Wednesday’s launch, according to Russian media reports. Russian space officials delayed the launch several months after construction mishaps and corruption marred development of the cosmodrome, which will eventually take over much of the launch activity currently based at the Baikonur Cosmodrome in Kazakhstan. But any shutdown of Baikonur is still decades away — Russia has leased the facility from the Kazakh government until 2050 — and Wednesday’s launch is the only mission on the manifest at Vostochny this year. A Russian government satellite is scheduled for launch on a Soyuz rocket from Vostochny in 2017, and a fraction of the 21 Soyuz launches ordered by OneWeb, the commercial satellite Internet venture, could originate from the new cosmodrome. Most of the OneWeb flights will lift off from Baikonur and the Soyuz launch pad in French Guiana. Russia is building a launch pad at the Siberian cosmodrome for the new Angara rocket, a replacement for the Proton booster. 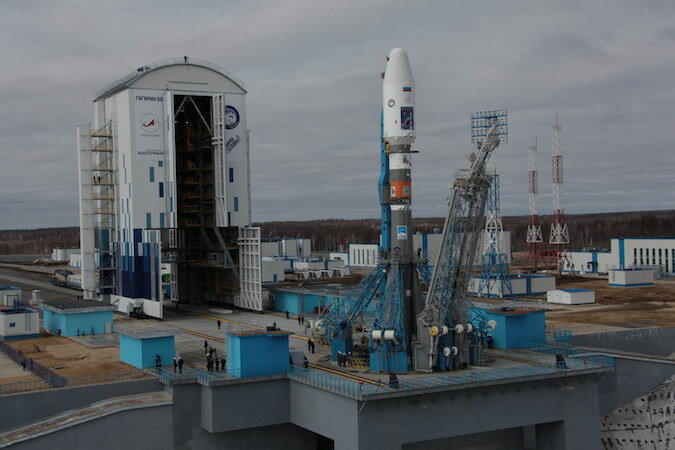 The first Angara launch at Vostochny is scheduled for 2021, and test flights before then will originate from the Plesetsk Cosmodrome in northern Russia. No Angara launch pad will be built at Baikonur. Crewed launches from Vostochny could begin as soon as 2023, according to plans released by Roscosmos, the Russian space agency. The Vostochny complex covers an area of 700 square kilometers, or 270 square miles. After Wednesday’s mission, construction crews at Vostochny will finish building support infrastructure at the forested cosmodrome and turn attention to the Angara launch facility. Teams completed construction of the Soyuz launch pad, integration hangar and a satellite processing clean room ahead of this week’s launch. Putin approved the Vostochny project in 2007, and construction began in 2011, aiming to be ready for an initial launch by the end of 2015. The first phase of the construction project, one of the biggest in Russia, cost about 120 billion rubles, or $1.8 billion, according to the Russian Interfax news agency. The cosmodrome’s total cost is estimated at 180 billion rubles, or $2.7 billion, Roscosmos said in December. 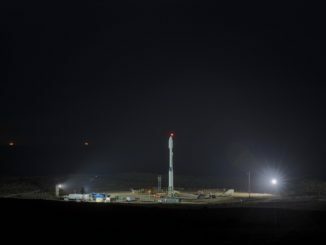 Workers rolled out the Soyuz-2.1a rocket to its launch pad Saturday and erected the iconic booster vertical on top of a cavernous concrete flame trench. A mobile service gantry, emblazoned with a mural of Russian cosmonaut Yuri Gagarin, rolled into position around the rocket for final preflight checks. The moveable tower is new to Russia’s space program, borrowing from the design of the Soyuz launch pad in French Guiana. Other Soyuz launch pads at Baikonur and Plesetsk were built at the dawn of the Space Age and feature work platforms that fold up around the rocket. The three-stage rocket will take off and turn northwest from Vostochny to put its three satellites into a near-polar orbit. It will be the second Soyuz launch in less than two days, coming after a Soyuz blasted off from French Guiana with five European satellites. Roscosmos said the rocket will fly with a long-range communications system to transmit telemetry to distant ground stations. The Soyuz trajectory northwest from Vostochny does not pass above ground stations normally used in Russian launches. The rocket also carries four on-board cameras in hardened cases to beam back live video of the flight, according to RussianSpaceWeb.com. A Volga upper stage will deliver mission’s three spacecraft passengers to orbit after separation from the Soyuz booster’s third stage. Named for Mikhailo Lomonosov, an 18th century Russian scientist and writer, the main spacecraft on Wednesday’s launch will weigh more than 1,400 pounds (about 645 kilograms) at liftoff, according to Lomonosov Moscow State University, the institute managing the project. The Mikhailo Lomonosov satellite will study high-energy cosmic rays and gamma-ray bursts, the most powerful explosions in the universe astronomers believe come from the collapse of massive stars at the end of their lives. The craft will orbit 304 miles (490 kilometers) above Earth, the university said in a statement. Other sensors on the spacecraft will look at Earth’s magnetosphere, the bubble that protects the planet from harmful solar and cosmic radiation. 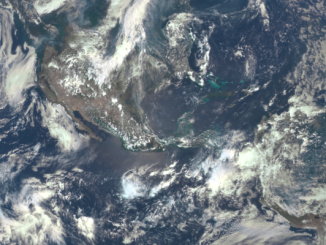 The 1,170-pound (531-kilogram) Aist 2D satellite, made by TsSKB Progress in partnership with Samara State Aerospace University, will demonstrate a new small spacecraft design with a high-resolution hyperspectral Earth imaging camera. Aist 2D also carries an innovative radar operating in P-band, a wavelength that penetrates through forest canopies and Earth’s surface to study underground structures. Aist 2D’s other science instruments will study the environment around the spacecraft and monitor how the satellite’s components respond to the harsh temperature extremes, vacuum conditions and micrometeoroid and space debris impacts in orbit, according to TsSKB Progress. The SamSat 218 satellite, a CubeSat built by students at Samara State Aerospace University, is about the size of a shoebox. 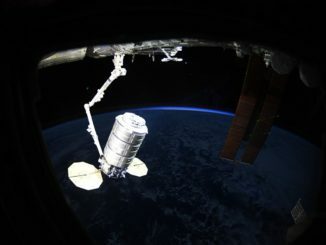 The craft’s mission is part-educational and part-technology demo, with its flight plan including tests in how to control tiny satellites in orbit.